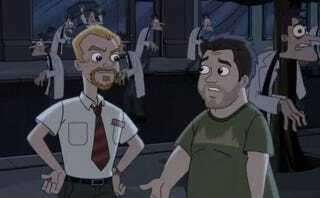 If its Marvel Super Heroes, Star Wars or Lost-themed episodes haven't drawn you in, maybe this will: this week's Phineas & Ferb takes on the zombie genre with a guest appearance from none other than Simon Pegg and Nick Frost, recreating their characters from Shaun of the Dead. And you can watch it here! This isn't the only cameo in the episode, titled "Night of the Living Pharmacist"; zombie godfather George Romero will also have a vocal cameo. The episode airs this Saturday evening at 8:00 p.m. on Disney XD.